The Algonquin Round Table was a group of New York City writers, critics, actors, and wits. Gathering initially as part of a practical joke, members of "The Vicious Circle", as they dubbed themselves, met for lunch each day at the Algonquin Hotel from 1919 until roughly 1929. At these luncheons they engaged in wisecracks, wordplay, and witticisms that, through the newspaper columns of Round Table members, were disseminated across the country. In its ten years of association, the Round Table and a number of its members acquired national reputations, both for their contributions to literature and for their sparkling wit. Although some of their contemporaries, and later in life even some of its members, disparaged the group, its reputation has endured long after its dissolution. The group that would become the Round Table began meeting in June 1919 as the result of a practical joke carried out by theatrical press agent John Peter Toohey. Toohey, annoyed at The New York Times drama critic Alexander Woollcott for refusing to plug one of Toohey's clients (Eugene O'Neill) in his column, organized a luncheon supposedly to welcome Woollcott back from World War I, where he had been a correspondent for Stars and Stripes. Instead Toohey used the occasion to poke fun at Woollcott on a number of fronts. Woollcott's enjoyment of the joke and the success of the event prompted Toohey to suggest that the group in attendance meet at the Algonquin each day for lunch. The group first gathered in the Algonquin's Pergola Room (later called the Oak Room) at a long rectangular table. As they increased in number, Algonquin manager Frank Case moved them to the Rose Room and a round table. Initially the group called itself "The Board" and the luncheons "Board meetings". After being assigned a waiter named Luigi, the group re-christened itself "Luigi Board". Finally they became "The Vicious Circle" although "The Round Table" gained wide currency after a caricature by cartoonist Edmund Duffy of the Brooklyn Eagle portrayed the group sitting at a round table and wearing armor. In addition to the daily luncheons, members of the Round Table worked and associated with each other almost constantly. The group was devoted to games, including cribbage and poker. The group had its own poker club, the Thanatopsis Literary and Inside Straight Club, which met at the hotel on Saturday nights. Regulars at the game included Kaufman, Adams, Broun, Ross and Woollcott, with non-Round Tablers Herbert Bayard Swope, silk merchant Paul Hyde Bonner, baking heir Raoul Fleischmann, actor Harpo Marx, and writer Ring Lardner sometimes sitting in. The group also played charades (which they called simply "The Game") and the "I can give you a sentence" game, which spawned Dorothy Parker's memorable sentence using the word horticulture: "You can lead a horticulture but you can't make her think." Members often visited Neshobe Island, a private island co-owned by several "Algonks"—but governed by Woollcott as a "benevolent tyrant", as his biographer Samuel Hopkins Adams charitably put it—located on several acres in the middle of Lake Bomoseen in Vermont. There they would engage in their usual array of games including Wink murder, which they called simply "Murder", plus croquet. Given the literary and theatrical activities of the Round Table members, it was perhaps inevitable that they would write and stage their own revue. No Sirree!, staged for one night only in April 1922, was a take-off of a then-popular European touring revue called La Chauve-Souris, directed by Nikita Balieff. No Sirree! had its genesis at the studio of Neysa McMein, which served as something of a salon for Round Tablers away from the Algonquin. Acts included: "Opening Chorus" featuring Woollcott, Toohey, Kaufman, Connelly, Adams and Benchley with violinist Jascha Heifetz providing offstage, off-key accompaniment; "He Who Gets Flapped", a musical number featuring the song "The Everlastin' Ingenue Blues" written by Dorothy Parker and performed by Robert Sherwood accompanied by "chorus girls" including Tallulah Bankhead, Helen Hayes, Ruth Gillmore, Lenore Ulric and Mary Brandon; "Zowie, or the Curse of an Akins Heart"; "The Greasy Hag, an O'Neill Play in One Act" with Kaufman, Connelly and Woollcott; and "Mr. Whim Passes By—An A. A. Milne Play." The only item of note to emerge from No Sirree! was Robert Benchley's contribution, The Treasurer's Report. Benchley's disjointed parody so delighted those in attendance that Irving Berlin hired Benchley in 1923 to deliver the Report as part of Berlin's Music Box Revue for $500 a week. In 1928, Report was later made into a short sound film in the Fox Movietone sound-on-film system by Fox Film Corporation. The film marked the beginning of a second career for Benchley in Hollywood. Not all of their contemporaries were fans of the group. Their critics accused them of logrolling, or exchanging favorable plugs of one another's works, and of rehearsing their witticisms in advance. James Thurber (who lived in the hotel) was a detractor of the group, accusing them of being too consumed by their elaborate practical jokes. H. L. Mencken, who was much admired by many in the Circle, was also a critic, commenting to fellow writer Anita Loos that "their ideals were those of a vaudeville actor, one who is extremely 'in the know' and inordinately trashy". They met at the sign of the Indian Chief where the cleverest of them—and those who were so excitedly sure of their cleverness that for the moment they convinced others as well as themselves—foregathered daily. There was a great deal of scintillating talk in this group of the significant books and tendencies of the day....They appraised, debated, rejected, finally placed the seal of their august approval upon a favored few. Groucho Marx, brother of Round Table associate Harpo, was never comfortable amidst the viciousness of the Vicious Circle. Therein he remarked "The price of admission is a serpent's tongue and a half-concealed stiletto." Even some members of the Round Table disparaged it later in life. Dorothy Parker in particular criticized the group. Despite Parker's bleak assessment and while it is true that some members of the Round Table are perhaps now "famous for being famous" instead of for their literary output, Round Table members and associates contributed to the literary landscape, including Pulitzer Prize-winning work by Circle members Kaufman, Connelly and Sherwood (who won four) and by associate Ferber and the legacy of Ross's New Yorker. Others made lasting contributions to the realms of stage and screen — Tallulah Bankhead and Eva Le Gallienne became Broadway greats and the films of Harpo and Benchley remain popular; and Parker has remained renowned for her short stories and literary reviews. 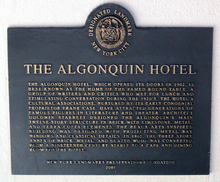 The Algonquin Round Table, as well as the number of other literary and theatrical greats who lodged there, helped earn the Algonquin Hotel its status as a New York City Historic Landmark. The hotel was so designated in 1987. In 1996 the hotel was designated a national literary landmark by the Friends of Libraries USA based on the contributions of "The Round Table Wits". The organization's bronze plaque is attached to the front of the hotel. Although the Rose Room was removed from the Algonquin in a 1998 remodel, the hotel paid tribute to the group by commissioning and hanging the painting A Vicious Circle by Natalie Ascencios, depicting the Round Table and also created a replica of the original table. The hotel occasionally stages an original musical production, The Talk of the Town, in the Oak Room. Its latest production started September 11, 2007 and ran through the end of the year. A film about the members, The Ten-Year Lunch (1987), won the Academy Award for Best Documentary Feature. The dramatic film Mrs. Parker and the Vicious Circle (1994) recounts the Round Table from the perspective of Dorothy Parker. Portions of the 1981 film Rich and Famous were set in the Algonquin and one of the film's characters, Liz Hamilton (played by Jacqueline Bisset), refers to the Round Table during the film. In 1991, the Algonquin Round Table was mentioned in the Seinfeld season 2 episode "The Phone Message". The Algonquin Round Table was featured in "The Young Indiana Jones and the Scandal of 1920", a 1993 episode of the TV series "The Young Indiana Jones Chronicles", in which the title character meets the group and attends at least two lunches. Wonderful Nonsense - The Algonquin Round Table is a documentary produced for the DVD release of that film in 2008. The Round Table is referred to in "The One with the Cuffs", a 1997 episode of the television series Friends. The Algonquin Round Table was mentioned in "Galileo", a 2000 episode of the television series The West Wing. The Algonquin Round Table is spoofed in several episodes of The Thrilling Adventure Hour. In 2009, Robert Benchley's grandson, Nat Benchley, and co-editor Kevin C. Fitzpatrick published The Lost Algonquin Round Table, a collection of the early writings of the group. In the 2015 film The Martian, the NASA JPL engineer Tim Grimes refers to the Algonquin Round Table when describing the crude communication JPL had established with stranded astronaut Mark Whatney: "Thirty-two minute round trip communications time, all he can do is ask yes/no questions, and all we can do is point the camera. This won't exactly be an Algonquin Round Table of snappy repartee." ^ Herrmann, Dorothy (1982). With Malice Toward All: The Quips, Lives and Loves of Some Celebrated 20th-Century American Wits. New York: G. P. Putnam's Sons. pp. 17–18. ISBN 0-399-12710-0. ^ Fitzpatrick, Kevin; Nat Benchley (2009). The Lost Algonquin Round Table: Humor, Fiction, Journalism, Criticism and Poetry from America's Most Famous Literary Circle (hardcover). New York, NY: Donald Books. p. 259. ISBN 978-1-4401-5152-1. ^ Meade, Marion (1987). Dorothy Parker: What Fresh Hell is This? (paperback). New York, NY: Penguin Books. p. 75. ISBN 0-14-011616-8. ^ Payn, G. My Life with Noel Coward. Applause Books (2000), p. 159. ISBN 1557831904. ^ Altman, Billy (1997). Laughter's Gentle Soul: The Life of Robert Benchley. New York: W. W. Norton & Company. pp. 167–8. ISBN 0-393-03833-5. ^ Bailey, Craig C. (August 1998). "Famous Vermonters, Part II". Business Digest. Archived from the original on 25 September 2007. Retrieved 2007-09-19. ^ Randall, David (June 29, 2002). "Dorothy, the Algonquin hotel and how the legend just kept growing". The Independent (London). Retrieved December 30, 2017. ^ Anderson, Susan Heller (20 September 1987). "City Makes It Official: Algonquin is Landmark". The New York Times. ^ Friends of Libraries USA. "1996 dedications". Archived from the original on 2008-05-06. Retrieved 2007-09-13. ^ Iovine, Julie V. (1998-05-28). "Algonquin, at Wits' End, Retrofits". New York Times. Retrieved 2007-09-13. ^ Algonquin Hotel. "Algonquin Round Table Musical "The Talk of the Town" Returns to Original 1919 Oak Room Setting". Archived from the original on June 29, 2007. Retrieved 2007-09-03. ^ Thomas, Bob (1988-04-12). "'Last Emperor' Leads Awards". The Gainesville Sun. Associated Press. pp. 1A, 14A. Archived from the original on 2013-01-24. Retrieved 2009-10-07. ^ "The Phone Message". SeinfeldScripts. Retrieved 2016-08-23. "Aviva Slesin collection of research and production materials for the ten-year lunch: the wit and legend of the Algonquin Round Table (1920s—1988)". Billy Rose Theatre Division. New York Public Library for the Performing Arts.